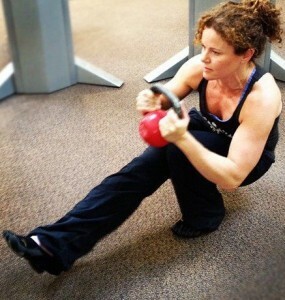 BP FitPro Julie Buranelli rockin' the Kettlebell! BP West Windsor FitPro, Julie Buranelli, shared this “rant” on our members’ website and I had to share it with you. I couldn’t have said it better myself…and even if you’ve never done one of our 6-Week Transformation Boot Camps, I think you’ll be able to take something very valuable away from what she wrote, no matter where you are in your journey of your best fitness and health. It’s worth taking the time to read…thanks Julie for inspiring us! Go back to your life before Body Project – imagine that TO-DO list and the things that remained undone at the end of the day. For me, it was those seemingly minor pampering, self-indulgent items like mani/pedi, some item of clothing I wanted and, yes, more often than not, the word WORKOUT that remained from day to day, week to week…if I had a choice of 2/3 – usually the workout would still remain. It wasn’t that I didn’t enjoy doing it– but it always seemed like if it wasn’t done HABITUALLY it wasn’t worth doing. It wasn’t as quick a fix as, say, getting your roots done, hair trimmed, nails done, drinks with a friend – those little things that instantly make us feel so good and, dare I say, pretty! So when I had a free afternoon or evening from work, family, and whatever other expectations were weighing me down – the quick fix would always win. The workout usually meant go hard and heavy (to make up for all the days I missed) and feel great for a few hours until I wake up sore for 2 days and then I’m hesitant to do it again because I don’t want to be down for the count for another 2 days. So better not to do anything?! Oddly, that is what it turned into. Post-6-Week Transformation – the first one (remember that, HardBody’s?) – everyone is exuding this fabulous energy of having changed their mindset – their attitudes – their self-talk. They are motivated and inspired to continue – the workout comes off the to-do list. It is now part of your routine, a habit. But that “high” wears off after a couple months. You aren’t getting those additional HIIT workouts in– maybe a few of you are starting to scribble in HIIT on your to-do’s (is that guilt, feeling of lack of accomplishment, disappointment in your self starting to creep back in?). Your weight loss has plateaued – you’re feeling a little lost at sea suddenly – you keep going to boot camp – and damn if those workouts don’t seem to be getting easier?! And my body fat went up?! What is going on? Maybe you decide something more has to be done – now it’s 3 extra HIIT workouts, train for 5K, and eating low-carb come onto the list. These items remain unchecked and start to stare at you and make you feel bad. You go into a sort of paralysis mode and don’t make much headway in getting those additional items off your list because you’re overwhelmed, you’re stressed, you’re not sleeping, and your knee is starting to hurt. You’re weight is creeping up and your feeling mushy where you were getting defined just a few months ago. I mentioned today at one class that we like to find reasons to beat ourselves up, make ourselves feel less than and that we aren’t doing ENOUGH. You are DOING enough – the question is how much are you beating yourself up for what you AREN’T DOING and how much is that affecting your BEING present in what you are doing. A habit can be a bad thing if you don’t love yourself. Good habits flip fast if you don’t check in with yourself regularly and up-the-ante a bit. You brush 3 times a day – but now you brush too hard and your gums are receding. You can never get ahead. So rather than add things onto your TO-DO list – tweak, tweak, tweak what you are already doing to make it better. Brush your teeth with the other hand so you don’t apply too much pressure. Be the Scientist. Figure out what makes you tick – what makes you tune in to the moment. How are you going to stay in that post-transformation mindset longer than a couple weeks? Let’s check in – what’s the reality? You’re doing the same thing you were so proud of yourself for (and getting results from) doing 6 months ago. Maybe the workouts are getting easier for you because you aren’t increasing weights. Your endurance has improved and you’re not trying to beat your own PR (personal records) during workouts. You are showing up but not pushing. Perhaps you’re doing too much, those 10 mile runs have put your body on alert and it clings to everything you feed it now and is hesitant to let go. Perhaps your knee pain is becoming more unbearable but you’re refusing to see a doctor because you know they might say to take a break from boot camp and you can’t bear that – so your workouts have lessened in intensity but you’re still having that fruit-laden smoothie post-workout and breakfast an hour later. So you can’t move as well – or you couldn’t possibly workout any more – so now what? Low Carb. High Protein. Gluten Free. Intermittent Fasting. Smoothies. Paleo. Inflammation Fish oil. High Fat Detox. Whole Grains. No Grains. Low-fat yogurt. Full fat Yogurt. Chocolate?! Eat when your hungry. Eat small meals all day. Dairy good. Dairy bad. It goes on…and on and on. And you’re frustrated and overwhelmed by all the conflicting information. Aren’t I going to get fat eating all that fat? How much protein powder should I be using? Do I drink my protein or eat it? Whole grains or no grains. And the most frustrating thing of all – no one, not your FitPros, not your neighbor on the mat next to you, NO ONE can tell you what the right answer is for you. We push the journaling for a reason – it helps you see trends. We tell you it will help US see trends- but we’re hoping eventually you’ll get to a point where YOU see trends. Many of you resent being asked to journal during a transformation – you get frustrated seeing your other boot campers have these “AHA” moments when it comes to their diets. You are being given so many tools to explore and improve your own well-being and become the best you that you can be. The tools are there for you when you’re ready – but you have to be ready and you’ll know you’re ready when it stops stressing you out and you actually take the time to BE in the moment of what your doing. How do I feel? Could there be a connection between the pizza I just ate and the headache? Oh – look, 2 weeks ago I had pizza and wrote down the same thing. Aha moment? Was it the dairy? Was is the gluten? Was it the tomatoes? Hmmm. I’ll have test that out and see how I feel after I eat those items separately. It’s a little work – but wow, that headache had me down for the count – it sure would be nice to know what caused it so I could avoid that happening again! So what is the point of all this?! Because I saw so many of you CHECKED IN for this transformation – especially our veteran HardBody members. I see that you’re “getting it” and committing to the “tweak”, exploration and expansion of some habits. This is impacting everyone in your light in such a positive way- your fellow boot campers, your family and, most importantly, you. Your movement has improved, your bodies have changed and more importantly your minds are changing. If you didn’t “feel it” this transformation – no worries. If you are frustrated about your BodyMetrix – it is understood. If the explanations of why your body fat % went up sound like a bunch of hooey – don’t despair – it is a number, you are a human – not a SUPER human – a mere human with 24 hours in day (8-10 of which should be spent sleeping – TOD!). There is only so much you can do in a day and you’ve got 45 minutes / 3 days a week carved out just for you and that is wonderful! Don’t go beating yourself up via a TO-DO list that is going to stress you out and make you feel you aren’t DOING enough. Just BE the transformation. Every Day. I think you all are the most amazing, strong, beautiful women. Thank you for inspiring me!